What are the tastiest strawberry varieties? Honeoye --- Honeoyes are very tasty and prolific. The variety is an early, June-bearing variety and usually gives us our first berries, then continues to ripen huge berries for a couple of weeks. Jewel --- This is a late, June-bearing variety, meaning that it starts to ripen just as Honeoye comes to an end and turns the strawberry season into at least a month of harvest time. I ripped out our Jewel strawberries a few years ago because the flavor isn't nearly as good as the previous two varieties, but I've yet to find a tastier, late variety. Perhaps you have a suggestion for a replacement? Allstar --- This was supposed to be a replacement for Jewel since it is a late, June-bearer. However, the fruits tasted like storebought berries. Beware! Fresca --- This is another variety you can grow from seed, but the fruits were awful. I ripped it out. I'd be curious to hear about strawberry varieties you've tried and loved. We hope to trial yet another late, June-bearing variety this year, but haven't chosen which kind yet. 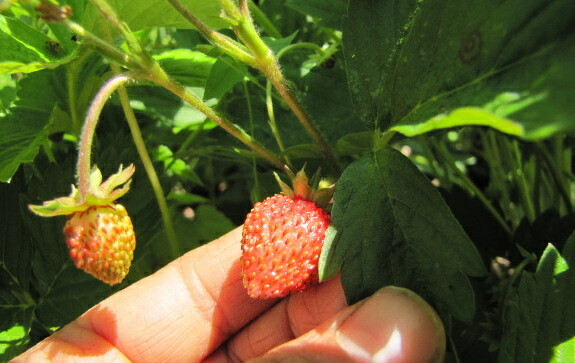 Meanwhile, you might be interested in reading about other factors that influence flavor of the strawberry patch if you're trying to grow the tastiest berries you've ever eaten. Our chicken waterer makes care of the backyard flock easier than a housecat. Thank you for the info on your strawberries. I just planted my first crop, started with 10 smallish plants of Sequoia. I almost got AllStar but was wanting more of an ever-bearing than a June-bearing. I may add some Quinault and Eversweet to the mix, after seeing how the first batch goes. I would love trying out the Pine-Berries (white berry/red seeds) but those are not allowed where I live. Last year I planted 105 Tribute ever bearing strawberry plants here in zone 5. We ate a ton of them, froze even more, and eventually gave loads away. They pretty much produced up until winter, and this spring have been growing like wildfire. As far as taste, well we picked some earliglow and honeyoe- both good tasting berries, and I think the tribute was right up there. Assuredly WAY WAY superior to that in stores. We had some fairly decent sized berries as well. No problems with them what so ever. I'd second Ozark Beauty for the everbearing category. I'd also recommend Tribute for the day neutral category. It almost pains me to check your blog lately with all the blooms and greenery - was out running on the lake yesterday and inquired on the ice quality from the fisherman, who informed me it was holding up well, almost four feet thick! 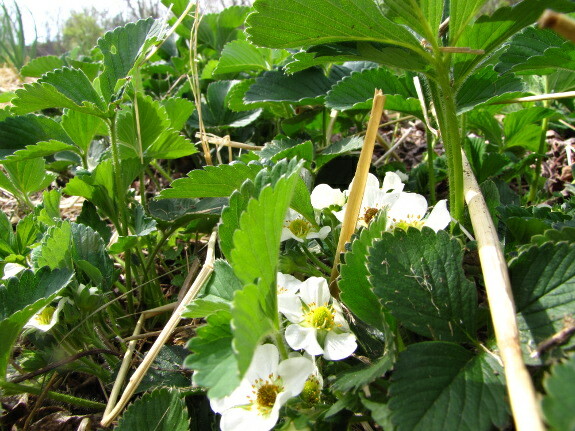 My strawberries are still under snow and its almost May - but I did check under the hood and the meristems are still green... strawberries for late July I suppose. I've had great luck with Ozarks up here - very hardy and they spread like wildfire once they get going. I tried both Quinault and Sequoia, but they never overwintered. Also added a wild strawberry hybrid that ripens pink to salmon colored - not terribly sweet, but proflific and makes great jam. With so many varieties, how do you keep it all straight, how can you tell them apart? Also what is your system for tearing out the old and keeping the new? Kathleen --- Good question! That really deserves its own post, but I'll answer here quickly instead. I keep track of all my plants by numbering each bed and then using a spreadsheet to tell what I planted where when. Then, once a year, I go through and see which strawberry beds are more than three years old. Those come out and get replaced by new beds, which I usually fill with newly rooted plants from the old beds (unless I'm starting new varieties). I've found that by setting out strawberries in the middle of the summer (then watering them well), we can eat from those beds the next year rather than breaking my heart by picking off flowers while the plants get established. You might also be interested in this post about the bed renovation I do every year to keep the younger strawberry beds in good shape. But... But... I LOVE my Allstar! It's the first I've ever had though, and was a freebie, and I did want another variety or two eventually. I thought the berries were much better than strebought, but it might just be the homegrown factor. At least they are still pretty and easy to grow, so I can learn about strawberries. Tristar is a day neutral, supposedly late-bearing variety with outstanding flavor. It is the favorite of Chef David Chang, whose taste I would darned near trust my life with. 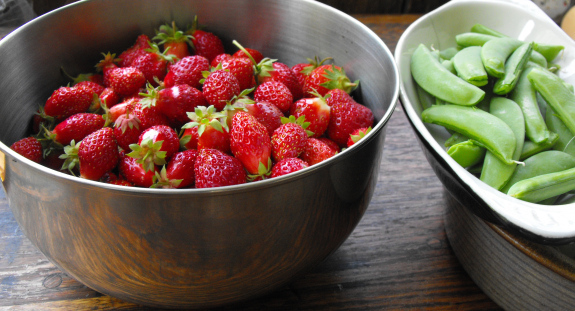 In general, I don't even like strawberries all that much--they're usually too tart for me. The only issue I think you may have with it is it's supposed to be a smaller berry, but in my experience, smaller berries yield better flavor. Maybe you could search online or look around your local area for different varieties to taste-test first.